1. It is a great size knife. Not too big, not too small. 2. The handle is molded with three “dividers” which create channels for your fingers to rest in. 3. The blade is nice and sharp right out of the box. 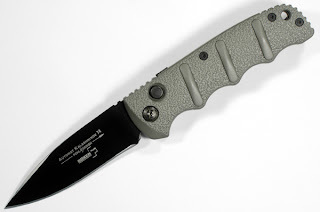 I have a partially serrated blade which I also like for various reasons–not the least being I think it looks great. 4. The details on the knife are amazing, the adjustment screw has a star on it which brings to mind the “red” Soviets of the cold war. 5. It comes in a ridiculously cool box–shaped like an ammo clip from the Kalishnikov machine gun. The blade is made from AUS8 stainless steel and the knife is manufactured in Taiwan. It has a good clip which can be removed if you so desire. The spine has a nice solid lock which I rarely use but some people dig locks. I rate this knife a 9.5 out of 10. With its low price and high quality workmanship, this is one knife that everyone should have.